Having kids is expensive. From maternity clothes and care to diapers, wipes and whatever else your child needs, you spend big time. But a new book, The Complete Book of Baby Bargains by Kimberly Danger, seeks to help parents with money-saving tips on baby gear. The Complete Book of Baby Bargains by Kimberly Danger (Amazon.com, $12.99) contains more than 1,000 ways to save money on things involving (you guessed it!) babies. Danger gathered the tips from her website, MommySavers.com. The layout is simple but well thought out, with 27 chapters across nine sections, divided based on the stage of the child. For instance, “Part One: Before Your Baby Arrives” contains advice on maternity wardrobes, the hospital stay and the baby registry. It doesn’t waste a lot of time on intros or the like; instead, Danger jumps right into the money-saving ideas and tips. The tips range from the simple to the complex. One great money saving tip is number 28, which suggests bringing your baby book to the hospital so that you can have the nurses stamp baby’s hands and feet in it — saving money on the at-home ink kit. Other money-saving tips aren’t so practical, however, such as number 29, which suggests bringing your own pain medication to the hospital for after the birth. While it might work for a woman who has a vaginal delivery, that wouldn’t work for a c-section mom. That said, in a book of this magnitude, there is no way that every tip could reach every reader. 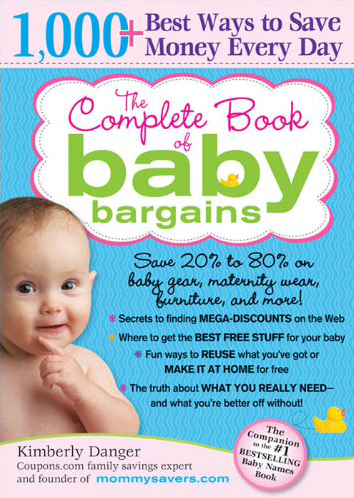 And the vast majority of tips in The Complete Book of Baby Bargains is accessible and actionable for most people. Danger provides a good deal of easy, practical advice that will save you money on many baby items. Want a sneak peek? Here are 20 tips from “Chapter 7: Diapering Your New Bundle,” reprinted with permission. 249. Buy diapers in bulk. As a general rule, the larger the package, the lower the price per unit. Those big boxes may be harder to lug home, but they’ll end up saving you money. 250. If you’re using coupons to buy diapers, however, get the smallest package available. For example, $2 off a $10 package yields a higher percentage savings than $2 off a $20 package. 251. Store-brand diapers from Target and Wal-Mart are just as absorbent as premium diapers and cost about $0.10 per diaper less. The savings can add up to as much as $30 per month. 252. Visit the Huggies website for printable coupons and information on special offers and promotions. 253. Luvs diapers cost 20 percent less than other premium diapers, and offer coupons as well, which can sometimes bring their cost below that of store brands. Visit the company’s website to sign up for promotions. 254. Check warehouse stores like Costco, BJ’s, and Sam’s Club for diapers. Most offer cases of premium diaper brands at substantial discounts. Don’t forget to bring your coupons along when you head to BJ’s for even more savings. They’re currently the only warehouse store that accepts them. 255. Check Amazon.com for diapers. They frequently run sales on Pampers, Huggies and Seventh Generation and offer free shipping if you spend a certain amount. No lugging those big boxes home: They’ll ship them directly to your door! 256. Combining manufacturer’s coupons and in-store sales can bring the cost of premium diapers to less than that of store brands, especially if your local grocer doubles coupons. 257. Buy the smallest diaper your baby can fit into comfortably. While diaper packs cost the same, the larger sizes have fewer diapers inside each package. Therefore, larger diapers of the same brand are more costly. 258. If the diaper brand you are using is leaking, you may need to go up a size rather than to switch to a more expensive brand. 259. If you find a diaper that is missing tabs or defective in some way, contact the manufacturer. They will likely send coupons, sometimes even for free products. 260. If your child has a tendency to soak through his diaper overnight, try placing a maxi pad inside the diaper rather than double-diapering him. Another solution is to use inexpensive diapers during the day and premium diapers at night. 261. Visit the Seventh Generation website to get coupons for the company’s bleach- and chlorine-free diapers when you sign up for the free Seventh Generation Nation club. 262. Visit the Goodnites website and find coupons in their “Special Offers” section. 263. Register for Pampers’ Gifts to Grow program to receive samples and coupons for Pampers products. Enter codes from the products you buy to earn rewards such as toys and gift cards. 264. Don’t stock up on diapers if your baby is nearing the next size. You don’t want to be stuck with a half-used package. 265. You can find diapers occasionally at thrift stores such as Goodwill and the Salvation Army. Stores often donate packs that have been opened or damaged in some way. Parents donate partial packs when their kids outgrow a size. 266. Use the big boxes/cartons in which diapers come to store outgrown baby clothes. The boxes are already marked according to size, so you’ll know what size the clothes are. 267. Find coupons for diapers and wipes on eBay. Search for keywords according to your favorite brand. Make sure you check the seller’s feedback rating and find out what the expiration dates are before placing your bid. 268. If you use premium diaper brands, ask your friends and family to cut coupons for you. Most are happy to help you out and don’t mind taking the time to do so. 269. Join an online coupon trading community to trade diaper coupons with other moms. Mommysavers.com has a bartering board where you can post your requests.